I've never been contacted out of the blue yet by any corporation or NHL team about an article or issue about which they would like some more publicity. Now, I'm not going to sell this blog out to Corporate America or anything, but I did receive an email in my mailbox four days ago from Gatorade. Yes, that's right - Gatorade. The energy drink. If you remember, I kind of ripped Pepsi for selling out the UHL All-Star Game in the You're Wearing That? - The Trilogy article. A lady named Katherine Stewart contacted me. She works for their public relation agency. She writes, "I’m contacting you on behalf of Gatorade Canada – I work for their public relations agency. Reading your blog it’s clear you live and breath hockey, I thought you might be interested in blogging about JS Giguere’s work with the Gatorade Sports Science Institute (GSSI) to tackle his hydration issues." She read my blog? Wow. Well, I do live and breathe hockey, so I decided to take a look at this. I was curious as to the actual science that Gatorade does to help athletes, specifically Giguere. Goalies tend to lose a lot of water through sweating, and it can adversely affect their performance. Last season, Sean Burke of the Los Angeles Kings was pulled in a game due to being dehydrated. In 2004, Ken Hitchcock of the Philadelphia Flyers refused to disclose an injury to goaltender Robert Esche that he eventually described as "the flu". It turned out that Esche was suffering from dehydration. And in 2005, Giguere missed two games due to dehydration. Miss Stewart also spoke of Giguere's problems with dehydration. "Leading up to the 2006/07 season Giguere was suffering from cramping and exhaustion during games," she wrote. "He saw a Gatorade television commercial about a runner who suffered from similar problems. He contacted the GSSI to see if they could offer solutions that could improve his performance. At the GSSI, Giguere participated in rigorous sweat tests and hydration analysis, and they gave him tips to help him overcome his dehydration and perform a Stanley Cup winning season." This piqued my interest. I have heard all the stories about Gatorade developing this sports drink for the Florida Gators that replaces electrolytes. Their success was proof that Gatorade had stumbled upon a great idea. It's such a good idea that there are now dozens of "energy drinks" out there. - Giguere suffered from cramping and dizziness after most games as a result of heavy sweating. Losing close to 12-15 lbs of fluid every game, Giguere was often dehydrated and susceptible to serious injury and decreased performance. - The Gatorade Sports Science Institute in Canada has focused its current research programs on evaluating the hydration status of elite hockey players prior to and during both practices and games. The GSSI has conducted sweat and hydration testing of Hockey Canada’s Under-20 team and OHL team, the Guelph Storm. Giguere spoke of his dehydration symptoms that he was having. "When I get dehydrated it really doesn’t feel great!" he states. "My ears get plugged and I start getting dizzy. The headaches follow and I know cramps aren’t too far behind. A lot of times I feel like I’m going to vomit, either on the ice or in between periods." Those symptoms are not good. Other world-class athletes have visited the GSSI as well. Yao Ming of the NBA's Houston Rockets, USA Soccer star Mia Hamm, Payton Manning of the Super Bowl Champion Indianapolis Colts, and New York Yankees shortstop Derek Jeter have all spent time going through the hydration tests from Gatorade. Now if you're almost sick from the sweetness of the Gatorade blog so far, you're not alone. Let's take a look at the drawbacks. Gatorade took some bad publicity from WebMD.com. They found that Gatorade actually erodes teeth the fastest when compared to soft drinks and fruit juices. You might be the most hydrated person on the Earth, but you can't smile. I don't know if that's a fair trade. If you're a top-level athlete, you're on television and splashed across newspapers and magazines all the time. Smiling comes naturally. I play hockey. I sweat a lot. I'm not a goalie, but I'm a big guy and my body tries to keep me cool by pouring sweat out of my body. I don't drink Gatorade at all. I prefer cold water. Why? Daniel on James Mirtle's blog explains it best. "Water is what you drink while losing fluids due to sweat. The reason you feel revitalized after drinking a sports drink is because of the simple carbs, which get turned into energy instantly in your body, just like sugar. Potassium is a great thing to consume before working your body and also after to replenish your body and help it recover faster. "This is the same reason you could drink a Pepsi on the bench and pretty much feel the same, all the simple carbs. Water and maybe a little bit of salt to tell your body to hold on to more of the water instead of sweating it all out. Correct breathing to push more oxygen through your blood and having strong muscles really helps as well. The more repe[t]itive tasks a muscle does, the more it doesn't strain and need a stabilizing muscle to compensate." It was repeated over and over during the playoffs this season that Giguere was certainly not the most athletic nor the most fit goalie in the league. He also suffers from a mild form of asthma. Could this be part of the problem with Giguere? Gatorade claims they provide four things water does not: electrolytes, carbohydrates, flavour, and "maximized fluid osmolality". The first three things are self-explanatory: Gatorade had a high-level of sodium, minerals and sugar while being artificially-flavoured. According to Gatorade, "maximized fluid osmolality" is the "Gatorade difference". According to the website, the explanation is as follows: "[r]esearch shows that with the right types and amounts of carbohydrates, fluid absorption occurs as quickly as water as long as the osmolality (particle content of the fluid) is close to that of blood (280 mOsm/kg). 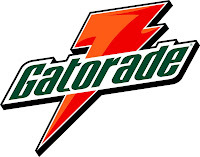 Gatorade beverages feature a 6% carbohydrate formula that ranges between 280 and 340 mOsm/kg, enabling Gatorade to promote faster fluid absorption than other sports drinks with higher carbohydrate concentrations and osmolality levels". If I read that correctly, Gatorade is no better than water. In fact, it is only better than other sports drinks. It provides energy in the form of simple carbohydrates, but it is no better than water at hydration, and, in some cases, it's actually worse than water as it has a higher osmolality. I appreciate Miss Stewart's email, and I look forward to Corporate America helping out hockey more than it already has. The NHL needs Corporate America to succeed, and Corporate America needs the fans of the NHL to buy their products. It's a give-and-take. However, if you send me an email about your product, be prepared for an objective view on it. I'm not saying Gatorade is bad for anyone nor am I saying that you shouldn't drink it. What I am saying is that when it comes to hydration, I'll just stick with good old-fashioned water. As my examination of teams who missed the playoffs last year continues, I am intrigued by the Columbus Blue Jackets. They have a very good pool of young talent, yet seemingly fall short of expectations every year. Why is this? I have not the slightest idea. I'm not saying that they are a Stanley Cup contender... yet. Since joining the NHL in 2000-01 as an expansion team, they have yet to appear in the playoffs. So where have the Jackets gone wrong? Where do they need to improve? Is there hope on the horizon? It appears that the Blue Jackets may have finally found a top tier goalie in Fredrik Norrena. Norrena will be 33 this season, but is still capable of being a starter in this league. He posted a 24-23-3 record last season with a 2.78 GAA and a .904 save percentage with three shutouts. Those are very good numbers for team that only won 33 games last year. The job is his, and it's his to lose come training camp. Norrena's backup this season should be Pascal Leclaire, but there is a feeling he may start for the Syracuse Crunch in the AHL if he starts the 2007-08 season like he played last year. The 24 year-old posted a 6-15-2 record with a 2.97 GAA and an .897 save percentage with one shutout. Clearly, 6-15-2 is not a good record in the NHL. The other option is Brian Boucher. Boucher has seen better days as an NHL netminder, but a job is a job. If he wants to be in "The Show", he needs to perform better than his 2-11-3 overall record from 2006-07. He did go 1-1-0 with the Blue Jackets, but his 3.79 GAA and .866 save percentage are simply brutal. If I haven't made it clear, the Blue Jackets have no backup goalie at this point that they can rely on to help Norrena. The Blue Jackets finished last season with 249 goals-against for the season, placing them 17th overall in the NHL. They were better than the Tampa Bay Lightning, who made the playoffs, at keeping the puck out of the net. The problem is that they were 28th overall in goals-for. They tied with the Chicago Blackhawks, and were only better than the Edmonton Oilers. That, by all means, appears to the problem. You won't win many games if you can't outscore your opponents. David Vyborny led the team last season with 64 points - 16 goals and 48 assists. Rick Nash was second in scoring, and Fredrik Modin was tied for third with Sergei Fedorov. Those four are expected to be contributors up front. The problem is that Sergei Fedorov has an acute case of "Alexei Yashin Syndrome" where he seemed to be invisible for most of the season. Nikolai Zherdev looked like he wanted to play hockey on a shinny rink rather than in an NHL system, and that's not going to help your team win. When Jason Chimera and defenseman Ron Hainsey outscore Zherdev, there's a problem with the way he's playing the system. Especially when he's far more offensively-gifted than both Chimera and Hainsey. Why is it that the most gifted Russian talents seem to turn invisible? Besides Fedorov and Zherdev, Alexandr Svitov didn't do much for scoring last season either. Granted, he is a younger player, but the third overall pick in the 2001 Entry Draft has done little to shed himself of the "role player" label. Svitov has played in 179 NHL games, and only posted 13 goals and 24 assists for a paltry 37 points. Incredibly, the Blue Jackets traded defenseman Darryl Sydor for this guy. 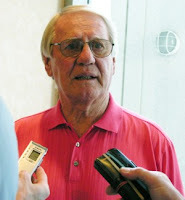 Citing "vast potential", Doug MacLean made the deal that enabled Tampa Bay to add a major piece of their Stanley Cup win when he made the deal on January 27, 2004. Do you want to know why Doug MacLean is no longer employed by the Blue Jackets? The term "vast potential". "Vast potential" would mean Svitov had more than four goals and seven assists for 11 points in 74 NHL games for the Tampa Bay Lightning. "Vast potential" would mean he would do more than play a checking role. Too many times was the term "vast potential" was used when Doug MacLean was making deals. I have yet to hear Scott Howson, his successor, utter that term once. In terms of potential, I like Gilbert Brule. Brule was a pretty good scoring forward for the Vancouver Giants in the WHL, and the 20 year-old seems to be getting more comfortable in the NHL. Dan Fritsche will be a good player for the Blue Jackets for years to come. His 27 points in 59 games showed potential, and, as a 21 year-old, his stock should rise. Rick Nash's 57 points was a little bit of a disappointment last season, but Nash is a bonafide star, and he will only get better as he matures. The 22 year-old has the look of a young Cam Neely right now, and we all know that Neely was the premier power forward in the game during the late-1980s and early-1990s. Zherdev, despite his woes above, is an offensive talent that could be comparable to Alexander Ovechkin. The key term in that last sentence, though, is could be. Zherdev simply doesn't look interested in using a system, and always tries to do too much when he's one-on-one, one-on-two, and one-on-three. A good player can make a move. A great player uses his teammates to burn the opposition. The 22 year-old shows a huge side of potential, but he never comes close to showing the climb to greatness. Geoff Platt looks like a promising young player, and Joakim Lindstrom could be a decent player too. If Jakub Voracek can have a strong camp, he could provide some very good creativity while bringing some decent size to the team. He is considered one of the most NHL-ready players from this year's draft, and Howson will give him every opportunity to make the team. The first-round pick of the Jackets is expected to be in the opening night lineup. What do they need? A bonafide scoring, passing center to play alongside Rick Nash and David Vyborny. Brule doesn't have the experience, Fritsche is probably better suited for the second line, and Fedorov just isn't the Fedorov of his Detroit days any longer. Daniel Briere would be an excellent fit in Columbus. Scott Gomez would excel between Nash and Vyborny. The Jackets would also be wise to go and get a guy like Ryan Smyth. Smyth would be the veteran leader up front that can score and help the younger guys, much like he did in Edmonton. And the Columbus fans would come to love his mullet in front of the net. Clearly, though, the Blue Jackets have a pile of good young talent up front. The Blue Jackets also have youth in their defence. Ron Hainsey is a great offensive defenseman, but needs work on his defensive play. Rostislav Klesla is still playing at an underwhelming level, but he is defensively better than he was a few years ago. Duvie Westcott is starting to round into form, but certainly needs more NHL experience. Ole-Kristian Tollefsen looks to be a diamond in the rough, so to speak, at 22 years-old, but brings plenty of upside. 20 year-old Kris Russell is looking to crack the lineup this season as well. 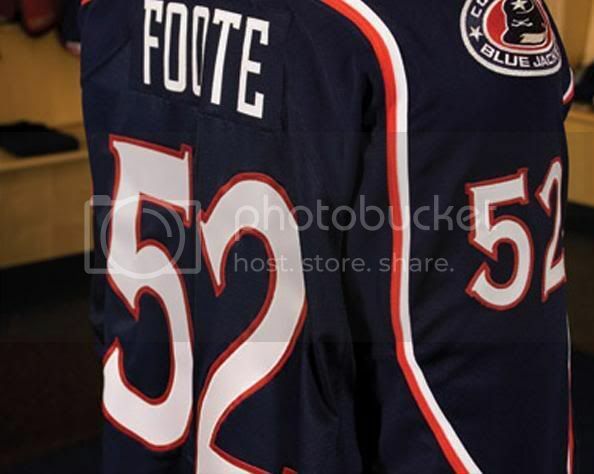 Of course, Adam Foote, the captain of the Blue Jackets, is the heart and soul of the defence. The 35 year-old is an anchor on the blueline, providing grit, toughness, determination, and some scoring. 32 year-old Anders Erikkson is a defensive defenseman who brings some grit to the table. His defensive side is certainly his best side. 30 year-old Bryan Berard should not be allowed to step on the ice for Columbus ever again. Berard was a project gone bad from the moment he put on the jersey. I believe that the starting six defensemen for the Blue Jackets this season will be Foote, Erikkson, Hainsey, Klesla, Westcott, and Tollefsen. Young Marc Methot could push Westcott for his spot. They'll be young, fast, and gritty, and that's good for the team. They need Hainsey's offensive contribution from the back, and it would a huge help if Klesla turned into Brian Campbell of this past season. Klesla has been given every opportunity to perform at a high level. It's time to start cashing in. While I give Columbus a shot at winning more than 33 games this season, I don't see them making the playoffs due to their overall team inexperience. However, Ken Hitchcock is a great coach and motivator, and he could have this team playing at a higher level than what is being expected for a building team. The Columbus fans are hungry for the playoffs, and this team, if it follows the path they are on, are probably a year or two from a playoff spot. Get ready for some fast, exciting hockey this season, Jackets fans. Your team may not make the playoffs, but I believe that they could be vastly improved from last season with the right free agent signings. The pieces are in place for them to be good. They just need those "glue guys" that bring everything together now. And that's what every team wants to hear: they have a chance. I spent some time on my last article talking about why the Leafs have actually taken steps backwards in the last few years to the point where they will most likely miss the playoffs for the second straight year this season. Today brings another one of those articles. The focus today is on the Chicago Blackhawks and their struggles to reclaim some of their mystique as an Original Six team. The only problem is that reclaiming that mystique won't happen this season. The Hawks have some very good talent up front. Martin Havlat, despite his injury woes, scored at a point-per-game pace last season. Radim Vrbata stepped up and finished second in scoring on the team. However, when Vrbata is your second-leading scorer with 41 points, you have trouble. Tuomo Ruutu and Patrick Sharp were solid contributors. Losing Michal Handzus for the season after only eight games hurt Chicago significantly. The Hawks went out and signed talented young forward Jonathan Toews. He should provide some additional scoring help, and he has greatly benefitted from his experiences at the World Junior Championships and the Men's World Championships. The Blackhawks also swung a deal for the talented Sergei Samsonov, but it remains to be seen if Samsonov can score like he did for Boston before the strike. They also drafted Patrick Kane, a legitmate junior scoring threat, but his small size may cut down on his scoring in the NHL. 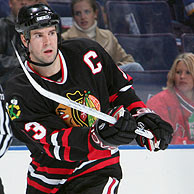 However, if Kane delivers as promised, he may be the second-coming of Steve Sullivan in Chi-town. Michael Blunden also deserves a look for the big club. The problem with the Hawks up front is that they are in need of three things: a talented first-line centerman and legitimate second-line wingers. Toews can probably play one of those wings, and Samsonov will help out. However, the Hawks should be looking to go after a guy like Drury or Gomez. Havlat needs someone who can feed him the puck, and the Hawks don't have someone like that right now. They freed up a pile of money in the Adrian Aucoin trade, so why not take a chance on a legitimate scoring threat? In any case, the Blackhawks were tied for the second-worst goals-for total last season with 201. They were tied with the Columbus Blue Jackets, and were ahead of only the offensively-anemic Edmonton Oilers. The other problem? Stopping goals. The Hawks were 25th in goals-against last season, and that has to change if they want to make it back to the playoffs or, at least, respectability. However, the Blackhawks are slightly ahead of the Maple Leafs in terms of letting the kids play. Duncan Keith and Brent Seabrook are the Blackhawks' defensemen of today, and they are playing well. They will only get better. James Wisniewski played pretty well for a youngster last season, and should get a chance to prove himself in camp this season. Cam Barker, Jim Vandermeer and Dustin Byfuglien all deserve a chance to be full-time blueliners as well. The key to these six defensemen is that no one is over the age of 27. This could be a solid core of D-men for the foreseeable future if the Hawks keep them together. Danny Richmond and David Koci will also challenge for roster spots. The trade of Aucoin for Andrei Zyuzin gives the Blackhawks an average, 30 year-old defenseman with a few seasons of NHL experience under his belt. Zyuzin should not, in any form, be considered a first-line defenseman, even in this young defensive group. The Leafs and Hawks are similar in their goaltending situation. Far too often, Nikolai Khabibulin was inconsistent last season. To help him out, the Hawks brought in Patrick Lalime who, for the most part, struggled in between the pipes. He showed flashes of brilliance, but never really controlled a game. Khabibulin ended up with a 25-26-5 record with a 2.86 GAA and a .902 save percentage. Those numbers are better than that of Toronto's Andrew Raycroft. However, Lalime finished with a 4-6-1 record with a 3.07 GAA and a .896 save percentage. Unlike Toskala, he is not a viable option in the new NHL with numbers like that. Khabibulin's massive contract also hurts the team in that moving him will take a miracle. Khabibulin will be 35 this season. If he doesn't perform up to his potential this season, he will be an expensive mistake/project for the last two seasons. Cory Crawford should step in and be the Hawks' backup goaltender. The 22 year-old recorded a 38-20-2 record in the AHL last season with a 2.84 GAA and a .909 save percentage. Crawford is probably a better option than Lalime right now, both statistically and economically. Taking this all into consideration, the fans in Chicago have suffered far too long in waiting for the Blackhawks to regain their elite status like they had in the early 1990s. However, I think that if Chicago stays the course they are on, they have a great young team that will only get better with time and experience. They have question marks after Havlat up front, their defence is young and relatively inexperienced, and their goaltending is inconsistent. Those aren't good ingredients for success. However, if all these things start coming together over the next couple of seasons, the Blackhawks could be another Nashville Predators: strong, tough, young, fast, and exciting. The only questions that remain are (a) will the fans stick around, and (b) is management willing to stay the course? I understand that Leafs-Nation is a place where people take hockey more seriously than breathing. 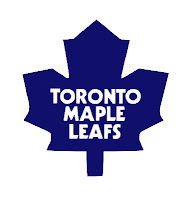 I get that the Maple Leafs is a way of life, and not just a sports passion. The one problem with this view, though, is that no matter how many people follow the Leafs, they're not getting any better. In fact, they're getting worse. The problem isn't with management or the players or the fans or the franchise. No, the problem lies within Leafs-Nation itself. Too many times are good young players jettisoned for an aging superstar. Too often are expensive mistakes made. Too often do the fans cry out for a star to be brought back long after he's been put to pasture. It has finally caught up with the Leafs in this last decade, and it's never been more apparent than what we've seen in the last few years. First, the goaltending situation of the Maple Leafs has never been on shakier ground. The acquisition of Vesa Toskala has only made things cloudier in TeeDot. Andrew Raycroft is a respectable goaltender who was relied on far too heavily last season to bail out the team in front of him. Management, specifically, John Ferguson Jr., decided the job that Raycroft did wasn't good enough as the Leafs missed the playoffs. Raycroft posted a 37-25-9 record last season with a 2.99 GAA and a .894 save percentage. His back-up, Jean-Sebastien Aubin, went 3-5-2 with a 3.43 GAA and a .876 save percentage. The Leafs were one point better than they were in 2005-06. In fact, since the 1997-98 season, the Leafs have used 12 goalies over those ten years - not a huge number, but hardly something to take pride in. The New Jersey Devils, by comparison, have used nine goalies, but one name has remained constant through the last decade for the Devils - Martin Brodeur. The Leafs have had Felix Potvin, Curtis Joseph, Ed Belfour, and Andrew Raycroft start for them over the same time period. Only Potvin was developed in the Leafs system. Why bring in Toskala? He's an expensive back-up, and, if he wins the starting role, Raycroft becomes an expensive back-up. Why not promote Justin Pogge? Why not promote Jean-François Racine? The Leafs traded away a promising young goalie in Tuukka Rask to get Raycroft, so why are they holding back Pogge? Look, Toskala is a good goaltender. There's no doubt about that. The problem is that guys like Martin Brodeur and Patrick Roy and Ray Emery have toiled in the minor leagues and have emerged as bonafide NHL goaltenders. The Leafs, whose fans demand more than excellence, need to start building from within. And it doesn't just go for goalies. Their defensemen are slow and prone to boneheaded mistakes. Bryan McCabe, for all the money he's being paid, is the most over-rated defenseman in the NHL today. If he consistantly produced big goals like Sheldon Souray or was as good as Nicklas Lidstrom, he would be worth the money. McCabe is not. He's not that good, nor will he ever be that good. In fact, Kaberle is the Leafs' best defenseman, and it showed after he was injured by Cam Janssen last season. Colaiacovo is getting better, and will continue to develop as he plays more. Ian White looks solid, and will get better as he matures as well. Staffan Kronwall should also get a long look at training camp this season. Guys like Pavel Kubina, Hal Gill, Wade Belak, and the aforementioned McCabe should be sent packing. They are slow and immobile, and that doesn't work in today's NHL. If the Leafs were forced to keep two, I'd stick with Gill and Belak. They are the lesser-talented duo of the four defensemen mentioned, but at least they don't rountinely kill you with bad giveaways and stupid passes. That, and they are cheaper in terms of salary which would allow the Leafs a chance to go after a guy like Scott Hannan. Up front, the Leafs are a mess. Mats Sundin will not win a Cup with the current group of forwards. Jeff O'Neill may be past his best days at 31 years of age. It's almost like he doesn't have any hands anymore. The Bates Battaglia Project should come to a screeching halt now that Mark Bell is in town. Chad Kilger, for all he's worth, has been a bust since arriving on the NHL scene in Anaheim. Travis Green should be shown the door after posting zero points in 24 games. Sundin is still worth the cash they are paying him. He produces and makes people around him better. The Leafs can live with Nik Antropov and Alexei Ponikarovsky on the second and third lines. Darcy Tucker provides grit, and, despite me thinking he's wasting a roster spot, did contribute well last season. Kyle Wellwood, Matt Stajan, and Alexander Steen all had solid seasons, and should be able to build on their latest campaign. Mike Peca, until he was injured, provided excellent penalty-killing, and was a vocal leader for the locker room. Yanic Perreault should not be brought back under any circumstance. I don't care if he has the highest faceoff winning percentage ever. The guy scored two goals and three assists in 17 games last season. He is not your second-line centerman. Third line? Maybe. But not at his salary. Alexander Suglobov should stay in the AHL for one more year. He tries far too hard to do too much when he should just worry about playing his role. Yes, he's supposed to be a scoring threat, but when you're triple-teamed coming across the line, you're not going to score many goals. So what does that leave? A lot of glaring holes. And therein lies the problem. Trading young talent like Brendan Bell and Brad Boyes to get aging stars is a huge part of the problem. Not promoting young role players like Ben Ondrus, Jay Harrison, Jeremy Williams, and Kris Newbury only encourages them to go somewhere where someone will give them a chance. The Leafs will be bottom-feeders until they learn that draft picks and scouting are essential in today's game. And that might be hard for Leafs-Nation to swallow, but it's the cold, hard truth of the new NHL. That's Henry Samueli. Henry Samueli owns the Anaheim Ducks. Henry's team just won the Stanley Cup. What does Henry do? He throws a party that makes your backyard barbeque party look like you're eating garbage. Granted, it's not every day that someone wins the Stanley Cup, but when you're from a little town in Manitoba, these kinds of parties are rarely seen. Actually, check that: NEVER seen. Reading through the Winnipeg Free Press this week, I came across an interview that Randy Turner did with the Penners who come from Winkler, Manitoba. Dustin Penner, as you know, is a member of those Stanley Cup-winning Anaheim Ducks. If you ever wanted to know what happens when you win a Stanley Cup, here is the entire interview from the Free Press. "Not every day you party with billionaires -- at least, not if you work at a hospital in Winkler. But if your kid is a Stanley Cup champion, well, it's tuxes and limousines and cigar-rollers for everybody. 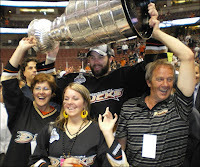 Such was the fairy-tale week for Linda and Terry Penner, who after watching son Dustin capture a Stanley Cup with the Anaheim Ducks found themselves a few nights later on the grounds of the mansion of Ducks owner Henry Samueli. And we can tell you this: Rich people know how to how to use a credit card. After all, you're gazing at a 10,000-square-foot, multimillion-dollar home on a cliff overlooking the Pacific Ocean, with waves crashing up against the rocks below. Waiters in tuxedos are serving dinner, which is a T-bone steak bigger than your own head. Oh, and don't forget the fireworks display off a cargo ship out in the bay. "You just stand there with your mouth open and say, 'Someone pinch me,' " Linda said, after the couple returned home earlier in the week. "It was just amazing. "And the cake. It was the shape of the Stanley Cup and it took four men to carry it. And it was delicious!" Added Terry: "It's right out of the movies. Unbelievable... people actually live the life." Indeed, if you ever want to know what it's like to get a taste of Cup celebrations, look no further than the Penners, along with daughter Ashley, and close relatives Dale Janzen and his family, getting a front-row seat to the Ducks' Game 5 victory over the Ottawa Senators. "For me, the moment Dustin was skating towards us was a very emotional time," Linda added. "You're running around and all of a sudden you're on the ice and you see your son skating towards you... it's just a moment that's forever branded into my memory. That was very special. "You're just so overwhelmed, it's almost like you're in a dream. And then I saw Teemu (Selanne) and his wife embracing and crying and that was really touching." Of course, the party was only beginning. It was off to the VIP tent crowded with family, friends and a guy from Latin America rolling cigars upon request. "At the moment it's hard to sink in because it's all going so fast," Terry noted. "You can hardly wait until he (Dustin) comes home and you can really sit down and talk about it, because at the time there's very little time to do much talking. It's all happy, happy, happy. "So when he gets home and we can rehash it all... that will probably be even more exciting than it was that evening (they won)." For Dustin, just having family waiting when the final buzzer sounded was almost as sweet as the Cup itself. "I'm happy they had a chance to experience it," Penner said, when reached by phone earlier this week in Newport Beach, Calif. "It's not like they're left out, but there's a distance from my life (in Anaheim). So the fact that they could be there and share that moment, I was happy for them." Good that the folks experience a bit of the high life, too. "(Samueli) paid a ship to pull up behind his house in the ocean and shoot off, like 20 to 30 minutes of fireworks," Penner noted. "How do you do that? Do you phone Newport or the coast guard and say, 'Hey, I need a ship to pull up to the back of my house and shoot off some fireworks? It's nuts.'" Then there was uncle Dale Janzen, with his wife Sandra and two daughters, Monica and Kristin, who'd followed Dustin's career from Bottineau, N.D. junior college to the University of Maine, to Cincinnati (AHL) and Anaheim. In fact, Janzen, along with Linda, were offered $3,000 apiece for their tickets to Game 5 by a scalper outside the arena. "Heck, no," Janzen, the president of Fehr-Way Tours in Winnipeg, insisted. "This was once-in-a-lifetime." Good thing, too. After all, it's not every day that you get waved out to the ice surface by a Stanley Cup champion, then get to hold the trophy over your head, too. "Oh, that was probably one of the major highlights of my life holding that (the Cup), especially at centre ice," Janzen said. "To see it happen was absolutely incredible for us. To be there, to be a part of it, it's still surreal. Every once in awhile my wife will say, 'Did we really do that last week?'" The Penners stuck around for the Ducks' public celebration last Sunday, attended by an estimated crowd of 20,000. Then it was back to the sedate streets of Winkler, leaving the butlers and fireworks behind in the land of Disney. But the warm and fuzzies haven't stopped yet. "Going grocery shopping is not a short trip," Linda chuckled. "It's just wonderful, though. Everybody wants to say congratulations and give you a hug. It's lots of fun." "It hits you that you're coming back to this little town. And this little town is where it all started for that boy. You're driving by the arena and there's signs that said, "Congratulations, Dustin Penner, Stanley Cup winner." That was just another reality check that this really did happen." "I just kept saying, 'It can't get any better than this,' and it did! Now it's just like the best." It just goes to show: You can have your Stanley Cup cake, and eat it, too." Just so you know, the people pitured above with Dustin Penner are his mom, Linda, his sister, Ashley, and his dad, Terri. And all got to hoist the Stanley Cup. Yeah, you could say that I'm a little jealous. I guess when you've got money to spend, and your biggest investment just won the most prestigious trophy in all of sports, you are allowed a little fun. Or, in Henry Samueli's case, boatloads of fun. Literally. But good on the Penners. They paid the price of their freedom for their son to play hockey when he was younger, and now it has paid off. And that is the ultimate investment someone can make: being there for one's child(ren) in any form. Now that I'm all envious of some billionaire, I'm going to find some place cool to hang out. The heat and humidity are getting to me, and I'm starting to think that I could own a Stanley Cup Champion franchise one day. Until I recover from this heat-induced insanity, keep your sticks on the ice! Like the image to the left, I'm hear to speak about more new jerseys. Get it? New Jersey? New jersey? Ok, bad joke. In any case, there were the debuts of new jerseys this week from Boston, Washington, and Columbus. Boston and Washington incorporated the traditional looks of their respective franchises into the new Rbk Edge Uniform System, while Columbus simplified their jerseys. The overall look of these jerseys is highly-pleasing, and this bodes well for the other 27 NHL franchises as well as the 29 AHL franchises. The Quad Cities Flames jerseys were also seen earlier this week, and they boast a clean and simple jersey. Again, a thumbs-up from this writer. Also decided this week was which jersey would be worn at home. The NHL Board of Governors chose to stick with the status quo in keeping the dark jerseys at home. That disappoints me as everyone knows that good guys wear white, and we all cheer for the home team, right? In any case, in order to introduce some more new jerseys, I'll do another complete run-down here of all the new jerseys thus far... just so you don't have to read back in case you missed anything. The first new jerseys that were made available to my eyes were those of the Quad Cities Flames. The home jerseys look a lot like the current Calgary Flames' jerseys, and I think this is a suitable jersey to keep. I wasn't a fan of the Flaming Horse Head jersey at all, and it was eerily similar to another terrible Flaming Horse logo. Following in the home jerseys' footsteps, the road jersey is designed the same, and both get a big thumbs-up from me. If Calgary follows their AHL affiliate's design, the Flames will look good from a jersey perspective. Too bad their team is heading down the wrong way on a one-way street. The next team to unveil their new duds was the Boston Bruins. The Bruins made a change to their logo, changing from their old logo by adding serifs to the spoked "B". I have a feeling that Providence will be following suit as well. The Bruins also showed off their new jerseys on Thursday. The home jerseys look far more traditional than their old ones did, and the road jerseys now have those same traditional elements such as the lace-up neckline. The secondary logo of the Bruins has two looks: the home patch and the road patch. They can be seen here on the home jersey and the road jersey. These jerseys are sharp. If anything, the Bruins improved their current jerseys with these new ones. On Friday, the Washington Capitals had a ridiculous online press conference and fashion show for their new jerseys. The Capitals went back to the future with their new logo, literally updating their original logo. They also incorporated their eagle logo and their Capitol Building logo into one secondary eagle logo on their new jerseys. As for the new jerseys themselves, the home jerseys are very red. In fact, the more I look at them, the more I wish they incorporated more white and blue. The font on the back is very clear to read, and that's never a bad thing. I'm ok with the road jersey having a lot of white. It's crisp and clean in its look, and that's good. In any case, the Washington Capitals are now back to red, white, and blue. Overall, I'll say thumbs-up from me. The road jerseys make up for the blinding red home jerseys. The Columbus Blue Jackets also showed off their new jerseys on Friday. The Jackets did make one significant error in these new jerseys: they eliminated the thick bottom hemline stripe. A thin one just doesn't have that hockey jersey feel. In any case, the font on the back remains the same. It was always easy to read, so kudos to the Jackets for not messing with a good thing. 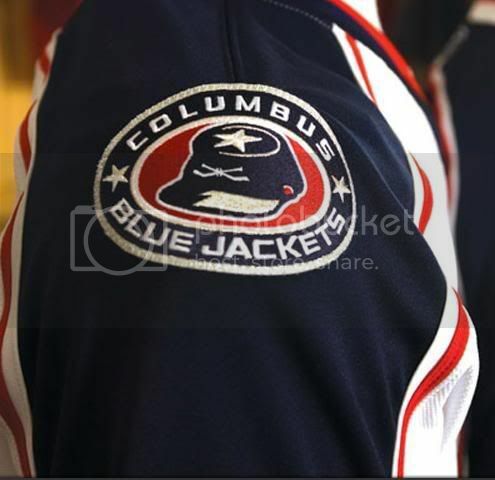 Gone are the insect logo and the CBJ logo, having been replaced with the alternate logo. The military feel of the jerseys is added to by the inclusion of the new shoulder patch. All in all, these jerseys are ok. Again, I miss the hemline stripe, but the jerseys are clean and simple which makes them alright in my books. EA Sports went a little overboard and may have shown off the new Carolina Hurricanes jerseys for next season. However, after spending some time on the EA Sports NHL 08 website, it appears that all of the players are wearing last season's jerseys. If you haven't heard yet, Minnesota is scrapping their green home uniform and sticking with their red alternate jersey as their current home jersey. However, several EA Sports screenshots are still showing the Wild in green: Gaborik making a move, Gaborik taking down Witt, and Fernandez looking for the puck. Either way, those could be Carolina's new jerseys for this season. Note the Islanders. They're also wearing last season's jerseys. You'll see more below. The Los Angeles Kings had their jerseys leaked as well. The Kings' home jersey is missing the bottom hemline again, leaving the words "Los Angeles" floating on the bottom of the jersey. The arm stripes seem a little off to me too. The road jersey is afflicted with the same problems. If this is truly Los Angeles' new jerseys for next season, they are the bottom of the barrel so far. I don't mind the colour scheme, but the jerseys leave something to be desired. The New York Islanders also had a picture published of what could be their new jerseys for next season. It appears that the Islanders are following the lead of the Barney Rubble Hairpieces. Why, you ask? Numbers on the front of the jersey. The lace-up neckline is a great addition, though, so I endorse that. The four-stripe shoulder patch for the four Stanley Cups that the Islanders won remains intact, and that's also a plus. The thin hemline stripe hurts the overall aesthetic, and there is far too much orange under the arms, much like this uniform debacle. I'm going on record right here. If the Islanders wear these jerseys next season, they will be forever called the "Long Island Broncos" much in the similar way I refer to the Buffalo Sabres as the Barney Rubble Hairpieces. It's not a very good jersey because of the glaring orangeness, the missing hemline stripe, and the front jersey numbers. The shoulder patch, the lace-up neckline, and the logo are still good, though, and those redeeming qualities certainly deserve merit. The best part of the picture is that #79 won't be playing for the Islanders, and that has to make everyone happy. All in all, these jerseys rank just above the Kings... which isn't a good thing. Those are all the jerseys so far. The Panthers posted a teaser on their website indicating that they'll have their new jersey unveiling in September. Other teams haven't posted a notice yet. So until the next unveiling, keep your sticks on the ice! Ok, let's start with the trades. I've been out working all day, but let's just say that I think a few teams have made a few mistakes. Needless to say, there were some major names on the move today, and parity seems to be levelling the playing field yet again. First, the Toronto Maple Leafs decided to shore up their goaltending situation. 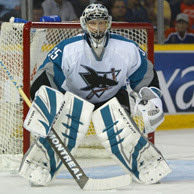 The San Jose Sharks traded goaltender Vesa Toskala and winger Mark Bell for a conditional first-round pick, a second-round pick in 2007 and a 2009 fourth-round pick. I think the Leafs made an average move. In 78 career NHL games with San Jose, Toskala compiled a 65-28-10 record, a 2.34 GAA and .914 save percentage with eight shutouts. Mark Bell was a bust in San Jose, but has performed well with Chicago, and the Leafs will be looking for that kind of production out of Bell this season. The addition of Bell also provides the Leafs with another potential scoring winger, something they sorely lacked this past season. If he doesn't perform, he is a very expensive role player at $2 million per season. The Sharks do have an abundance of good, young wingers so moving Bell isn't a huge problem. Replacing Toskala might be, but Nabokov is the man in San Jose, and finding a quality back-up shouldn't be that hard. Getting the draft picks will certainly help. Tomas Vokoun, the goaltender who has carried the Nashville Predators from also-rans to Stanley Cup contenders, is on his way to Miami. The Florida Panthers traded a first-round selection in the 2008 NHL Entry Draft, a second-round selection in the 2007 NHL Entry Draft, and a conditional second-round selection in either 2007 or 2008 for Tomas Vokoun. 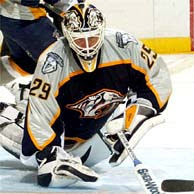 Vokoun was 27-12-4 with a 2.40 GAA and .920 save percentage in 44 games with the Predators last season. He missed some time with a thumb injury, and in his absence, Chris Mason put up stellar numbers with 24-11-4 record, a 2.38 GAA, and .925 save percentage. As the cheaper of the two options, Mason will be staying in Nashville while Vokoun will be going to toil for the Panthers. 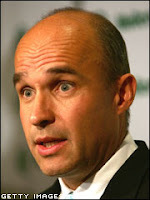 ... Jim Balsillie. 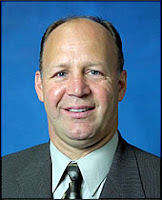 Current Predators' owner Craig Leipold advised the NHL to no longer consider Jim Balsillie as a prospective owner of the team. Leipold told the league the absence of a finalized sale agreement and Balsillie's desire to move the franchise to Hamilton are the reasons for his decision, although he will consider Balsillie the owner if a binding agreement is put in place. Seriously, what is with Balsillie? Enough is enough. This guy should not be allowed to approach the league for a team ever again. EVER. He screwed around the with Penguins for a few weeks, and then pulled his bid when he was told he couldn't relocate the franchise. Now, he's done the same thing with the Predators. If I'm Gary Bettman and the NHL Board of Governors, I'd tell this guy to take all his money for a long walk off a very short pier. Stop screwing around with teams. This is not some toy store; it's a professional hockey league. Find a hole somewhere and die, Balsillie. You've screwed around in this league two times too many. Kansas City seems like a better fit than Hamilton anyway. As for another trade, Adrian Aucoin waived his no-trade clause for a chance to be re-united with "Iron Mike" Keenan. The Blackhawks traded his $4 million salary and a seventh-round pick in 2007 to the Calgary Flames for defenseman Andrei Zyuzin and prospect Steve Marr. Calgary acquires a big, immobile defenseman with a monsterous salary for what reason? What is going on in Cow-town? Has Mike Keenan hypnotized Darryl Sutter? Who is running this team? Good luck, Calgary. Enjoy your top 10 draft pick in 2008. 'Nuff said. Here's one of the highlights of draft day. The Washington Capitals unveiled their new jerseys earlier today, and I think they're nothing special. Not bad, but not good. The Capitals went back to their red, white, and blue colour scheme, and that's a good idea, but it doesn't feel like the Capitals. Anyway, thanks to the miracle of computer technology, I've managed to grab a couple of images from the Caps' online press conference. Here are the front views of both the home and road jerseys as modelled by Capitals' players. The font on the rear of the jerseys are easy to read and simple, making the font one of the good things about the jerseys. The logo is designed with three stars above the team name to represent the state of Maryland, the District of Columbia, and the state of Virginia. The logo harkens back to their early logo, and I like that. The numbers are very easy to read, as I stated above, and Pierre Maguire of TSN says that the Capitals no longer look like "postal workers". The new secondary logo also harkens back to a previous logo in that the Capitals brought back the eagle. The raised wings make a "W" that stands for Washington, the lower portion has the shape of the Capitol building, and the eagle sports the colours of the Capitals. The Blue Jackets also unveiled their new jerseys tonight, and they look pretty good as well. The Blue Jackets did away with the insect logo and the CBJ logo, replacing them with the alternate flag logo. I don't like how the Jackets removed the big horizontal hemline stripe that is common on current hockey jerseys, but the new jersey avoids messy and complicated which is good. The rear font didn't change and is still very readable, and that's good. The military shoulder patch looks good too. All in all, I think the new jerseys look pretty good, with Boston and Washington going back to traditional elements of which I am a huge fan. Washington's home jersey could have used more white and blue to offset the red, but they're ok. The Rbk Edge Uniform System hasn't limited teams in their design thus far, and I am anticipating good things still to come for the rest of the NHL. So that's the first round. There were 10 American-born players selected, which tied an NHL Draft record, and, for the first time ever, two Americans were selected first and second overall. If you're the Penguins, Rangers, Blues, or Wild, you have to be happy with your selections. If you're the Oilers, it appears that Sam Gagner is your Sidney Crosby. If you're the Thrashers, Islanders, Sabres, Stars, Lightning and Devils, you didn't get much airtime in the first round. Good luck to those teams as it is apparent in the "new" NHL that draft picks play a huge part in your franchise's overall success. I posted the new Bruins logo below on the Slight Change article I posted this morning. I said I didn't mind the new logo, and I have to say that it has grown on me throughout the day. I like the logo, and don't mind the secondary logo. They both evoke the Bruins' tradition while keeping with the "new" NHL feeling. Kudos to the Bruins for not being radical when they certainly had a chance to go off the board with their logo re-design. 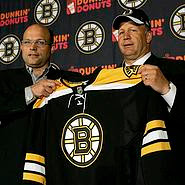 As for the reason why you may be reading this article, the image to the left shows Claude Julien holding the new Boston Bruins home jersey. Yes, it looks somewhat similar to their old jerseys. This, by all means, is very good. I am a huge fan of the lace-up neckline for the jerseys. They still carry the traditional horizontal hemline at the bottom of the jerseys and across the sleeves of the jerseys. After all has been said and done, I am very happy with these jerseys, and look forward to seeing the Bruins in action next season. Thanks to Jeff I. over on the Uni Watch blog, he provided images of both the home jerseys and road jerseys for the Bruins next season. The Boston Globe also showed off this image today which shows the entire Rbk Edge Uniform System of the new Bruins "uniform system". As I stated earlier, I am very happy with the way the Bruins' new duds look. They are highly traditional for their new look, and certainly incorporate the familiar Bruins' look. If you're a Bruins fan, which I am not, how can you not be happy? The Boston Bruins are planning to hold a press conference today where they will introduce Claude Julien as their new head coach. It is thought that this is where they will unveil their new Rbk Edge uniforms as well. However, the image to the left is a little bit of a teaser. The Bruins' splash page has a Flash movie about their logo changing, and that's the new logo to left. Yes, they've added a little serif to the famous spoked "B". Is it good? I tend to think that it could be good. What do I mean? Well, without a new jersey to judge it against, it would certainly work on the Bruins' old jerseys. I have a feeling that Providence in the AHL will follow suit with the serif on their spoked "P" in the AHL as well, and that's alright too. I'm going to be busy for most of the day, but don't think that I'm not going to find an Internet connection somewhere to see these new jerseys. After the Washington Capitals "leaked" their new jersey design on their website yesterday, I anticipate that Boston will have some sort of Milan-like fashion show for their new duds. Introducing the new Boston Bruins logo. The "Hub of Hockey" rolls on. Now if they could just find some players to bring back the Bruins attitude of the Esposito-Orr era, I'd really buy into that "Hub of Hockey" moniker. The logo, in my opinion, isn't that bad. Until later today, keep your sticks on the ice! I understand that professional hockey is a business. I get it when teams are bleeding red and looking for a way to make it stop. In hockey, teams try all sort of things to make money: promotions, acquiring superstars, and finding more sponsors. The one thing I've never understood is why teams that are bleeding money trade their best players away when they need them more than ever. This brings me to the deal that the Nashville Predators and Philadelphia Flyers swung on June 18. The Predators dealt the rights to free-agents-to-be Scott Hartnell and Kimmo Timonen to the Flyers for the same first-round pick they dealt to the Flyers to get Peter Forsberg who is also an impending free agent. The Flyers wasted little time in signing both of these players. Hartnell signed with Flyers on a 6-year, $25.2 million deal for a cap hit of $4.2 million per year, while Timonen agreed to terms on a 6-year, $37.8 million contract for an annual cap hit of $6.3 million. Here's the kicker. The Predators have to average 14,000 fans this season in order for Jim Balsillie not to enact a clause in the lease with the Sommet Centre to leave. David Poile, if he doesn't re-sign Forsberg, essentially traded Hartnell and Timonen for nothing. The overall effect of that Forsberg trade, at this point, is that Nashville traded Hartnell and Timonen for Forsberg, and have nothing to show for it three months later. If you're trying to keep a team in town, this certainly doesn't help. Three stars gone, and all you're left holding is a draft pick. Good luck, Nashville. Hamilton is a nice place to live, I've heard. It appears to me that the Boston Bruins are the team that enjoys garage sales the most in the NHL. Or maybe they're just garbage-pickers. Either way, it appears that if you've been dismissed from the New Jersey Devils as a coach, the next place you're going to end up is behind the bench of the Bruins. While the official announcement is expected today, the Bruins have confirmed to TSN that Julien will be announced as the head coach. Julien follows in the footsteps of Robbie Ftorek, another former Devils coach who was dumped before the playoffs, in terms of resurfacing in Beantown. Honestly, I believe Julien to be a solid coach with a good understanding of the game. I think this will be a good hiring for the Bruins, but it may take a couple of years to see any immediate change. Boston has some talent, but not enough goaltending and not enough pure scoring talent to challenge for the divisional title. However, Julien should show results, and that is good news for Boston. After a listening to rumours all week about a shake-up in Ottawa's front office, it finally happened. John Muckler is out, and Bryan Murray is in. Less than two weeks after their most successful season ever, the Senators made a major move in trying to take the next step to a Stanley Cup victory. Bryan Murray was due to be a free agent in a couple of weeks, and it could be said that this was a way to secure Murray's services when he was interested in becoming a general manager once his coaching contract with Ottawa expired. In any case, Bryan Murray will be making the final say on who gets drafted in Columbus on Friday night, and John Muckler will be watching from home. I can't say this is a bad move. Muckler's made two significant moves during his tenure. He helped organize the Martin Havlat trade in which the Senators received defenseman Tom Preissing. He also swapped Marian Hossa and Greg de Vries for star winger Dany Heatley. Muckler brought in Mike Comrie, Oleg Saprykin, and Martin Gerber, but all have been disappointments in terms of their overall contribution. Murray, as it has been documented, was largely responsible for the Anaheim Ducks' success this season as he had been responsible for bringing in players like Andy McDonald, Dustin Penner, Corey Perry, Ryan Getzlaf, and Chris Kunitz. It appears that Ottawa is hoping that Murray can bring the same young talent to Ottawa in order to help them win the Cup. The only way to have Murray do that would be to remove Muckler. Time will tell if this is a good move by the Senators. As I have been mentioning since last week, the Rbk Edge Uniform System is coming to a rink near you sometime this summer. Both the NHL and the AHL will be using this new "uniform system" next season, and people are anxious to see what this new "system" will look like. Thanks to "bcrt2000" over on the HFBoards.com site, it appears he snapped a couple of photos during the Quad Cities' logo unveiling ceremony that shows the new Rbk Edge template in action. The home jerseys and road jerseys are nothing special, and hardly differ from their current jerseys aside from the lack of horizontal stripes. I will say that the lack of horizontal stripes is a big loss to the jerseys as they look more like cycling shirts than hockey jerseys, but I'm still willing to give them a chance. I'll see more at the draft this Friday, but I believe we're looking at Calgary's new look here as well. Ok, that's all for today. Have a good one! Until next time, keep your sticks on the ice! I had made mention five days ago about how Eric Staal will be appearing on the cover of EA Sports NHL 08. Well, EA Sports has decided to add another new feature, and one that I am extremely happy about. EA Sports announced on June 12, the same day they announced that Staal will be appearing as the coverboy, that they will be including all 29 AHL teams as playable teams in NHL 08. Why does this make me happy? I am a fan of AHL hockey. I like watching the kids trying to earn an NHL job. And since the AHL has never been featured in a game before, this is an excellent marketing tool for the NHL and the AHL. If you want people to notice you in North America, you need to market yourself to that group of people. Will it result in greater NHL ratings? Probably not, but it is noteworthy that a minor league will be included on a major league game. "The American Hockey League will be featured in the new NHL® 08 game from EA Sports, with all 29 teams from the primary development league for the NHL fully playable." "NHL 08 will feature an exclusive AHL license for the first time, with all 29 teams from the primary development league for the NHL fully playable in game." "The EA SPORTS NHL franchise is the #1 selling hockey game and the #1 selling sports game in Canada. NHL 08 is being developed under the EA SPORTS by EA Canada in Vancouver, B.C. The game will be available for the PLAYSTATION®3 system, PlayStation®2 computer entertainment system, Xbox 360™ video game system from Microsoft, and PC." In relation to that last paragraph, the NHL franchise is the #1 selling sports game in Canada. Hopefully, the inclusion of the AHL teams will make AHL cities a little warmer to the idea of the NHL franchise, and promote the viewing of hockey on television. Hey, a guy can dream, right? Until next time, keep your sticks on the ice! Can't Spell Flames Without "Lame"
The Quad Cities Flames unveiled their logo on June 14, and let's just say that I am underwhelmed. I'm not saying that this logo is bad, but I am saying that the Flames' organization could have done more in terms of being creative. Instead, the Flames just took the easy way out and turned the "C" in Calgary to a "QC" in Quad Cities. Seriously, if they spent any money on a design team for this logo, they wasted it all. I could have photoshopped it for $20. And maybe an authentic jersey. But I digress. 'The Quad City Flames today introduced the team’s primary logo. The logo features Calgary’s ‘flaming C’ logo joined by a flaming Q. The logo was unveiled during a press conference and fan party at Sully’s Pub in Davenport. 'It was important to us that our logo reflected our partnership with the Calgary Flames, while also incorporating ‘QC’ which is symbolic of the area we are so proud to call home,' said Quad City Flames president Tim Taylor. 'The Calgary Flames organization has a rich and storied history, and we’re thrilled to have the opportunity to be their partners in addition to being members of the American Hockey League.'" The Calgary Flames and Quad Cities Flames have redefined the term "unoriginal". Thumbs-down from me. This logo is overly disappointing. If all you see is static to the left, do not adjust your monitor. The problem with the picture is that it represents most people's televisions in the United States when it comes to hockey on television. I went out on a limb in March with my Part Of Our Social Fabric article and basically said that the NHL was force-feeding a sport to Americans who had never been exposed to it, and, as a result, have not embraced it whatsoever. I don't think anyone from ESPN reads this blog with the exception of Mr. Paul Lukas. However, it appears that Gene Wojciechowski decided to tackle the same issue on June 15th. In reading Jibblescribbits' blog, I discovered that Wojciechowski basically made the same argument as me, although he came across a little more harshly than I did (in my opinion). Why am I writing about this? For starters, it took a major sports network almost three months to "report" on what I had pointed out. Wojciechowski even goes as far as saying that "[t]he reality is that hockey isn't part of this country's sports DNA. Canada, yes. The USA, no". In my article, I made the same "profound statement", as described by Brad, that "[t]he Original Six teams were bred into us, almost telling us genetically who to cheer for". Now I'm not saying that I am better than Mr. Wojciechowski. In fact, he's a heck of a good writer for ESPN, and I enjoy his insights. The problem that I have with his examination of the NHL is that he is addressing an issue that no one cares about in the United States when there is Major League Baseball going on, the US Open golf tournament going on, and NASCAR races going on. I can't tell you how many hits his page has had. I can't tell you if he's received any comments on his article. I do know that it is a fairly well-written piece that basically tells the American public that they aren't watching, and is a somewhat backhanded slap to the NHL's face in terms of their business model. Again, he's preaching to the choir. The American public know they aren't watching. In fact, they aren't reading or caring about the NHL, especially when there are other sports being played that they are watching. I don't know what to think of the timing of the release of this article. If no one watched the Stanley Cup Finals, does anyone care about one writer's thoughts on no one watching? Mr. Wojciechowski identifies the problems with the NHL, but does little to offer solutions to these problems. And what bothers me more is his laisser-faire attitude towards the biggest sports network in the United States dropping the NHL. "The NHL used to be on ESPN, where it didn't exactly get top billing, but at least you knew where to find the league and Barry Melrose's mullet on your remote" is what was written. Yes, we're all aware that it didn't get top billing. Hell, it barely received five minutes of airtime most nights, and the NHL was lucky to have highlights shown of games not involving the Rangers, Kings, Blackhawks, or Sharks. I understand the concept of not biting the hand that feeds you, but I find it hard to stomach Mr. Wojciechowski's argument when he puts little blame on "The Worldwide Leader In Sports". They have a responsibility to report the news objectively and without prejudice, yet the NHL gets as much Sportscenter coverage as competitive lawn darts. "Objectively and without prejudice" is quite a profound statement. Can a reporter make a commentary while being objective? My answer is no, but one shouldn't be allowed to take pot-shots at a league that is trying to find ways to break through the fog. If one needs a comparison, Sportcenter celebrated the return of baseball from its strike by showing highlights from every game for the first ten minutes of Sportscenter every single night. Should hockey not get the same credit, especially since it is the major winter sport in North America? Brian Burke, GM for the Anaheim Ducks, made an interesting statement about hockey in the southern Untied States: "[a]lmost every kid in America plays football, baseball or basketball. All you need is a field or cement court. 'But you can't just be a hockey player,' he says. 'It's complicated. It's difficult. It's expensive. So we don't have a ready-made fan base'". And that's absolutely true. However, ESPN can and should do more to help the NHL grow its fanbase. I don't need to be told that it's all about bottom-line with ESPN as they are owned by Disney, the same company that sold the Anaheim franchise a couple of years ago. I understand that money is money, and if ESPN isn't making money, they won't last very long. The NHL is not the NFL. It won't be a multi-billion dollar industry for at least a decade. The difference is that someone took a chance on the NFL's business model and gave them a television contract on a major network. Through the gains and losses, the NFL now has the most lucrative television contract known to man. ESPN has shows devoted to the NFL. The NHL has none. See the problem? I guess what this boils down to is my dislike for Mr. Wojciechowski's article in that he questions the way the NHL goes about its business, but does nothing to solve those issues. He shouldn't have to be responsible for solving anything, but any idea at this point would be a good idea. I also am not blaming ESPN 100% for this problem with the NHL's television ratings. However, I am blaming them for calling themselves "The Worldwide Leader in Sports" when they really don't give a damn about anything that won't get them ratings. That, in itself, is an insult to the NHL, and perhaps the NHL should remember this if and when they start climbing the ratings ladder again. If the Worldwide Leader wants to get in on the NHL, they should at least have the guts to lead Sportscenter with hockey once in a while. If no one watches hockey in the United States, and the biggest sports network ignores it like it has a contagious disease, how can you grow the game? It's a lesson in futility. Sometimes, I write these blog articles and find myelf asking "why" a lot. This is one of those blog articles now. It has been reported that Darryl Sutter, GM of the Calgary Flames, is preparing to give Mike Keenan the reigns in Cow-town. Yes, the same Mike Keenan who ran the St. Louis Blues into the ground in the mid-1990s. Yes, the same Mike Keenan that Canucks fans have not forgiven. The same Mike Keenan that has been to the playoffs twice since winning the Stanley Cup in 1994 with the New York Rangers, and only won one round. It's not like Jim Playfair didn't do a good job in Calgary. He led the team to the playoffs this past season against a superior Detroit Red Wings team. They even took two games against those Wings. However, the same affliction caught up to Calgary in the playoffs as it did in the regular season: a distinct lack of scoring punch. Will Mike Keenan change this? Hardly. "Iron Mike", since winning the Stanley Cup in 1994, has coached 453 games in four different cities. He has only coached two full seasons in that time. His record is a mediocre 174-195-64-20 for a .384 winning percentage. Jim Playfair's winning percentage last season was .585. The only season that Keenan had a higher winning percentage than Jim Playfair since 1994 was during the strike-shortened season of 1994-95. Keenan hasn't has a team in the playoffs since the 1995-96 season when his St. Louis Blues lost in the second round. I believe Darryl Sutter is a smart and savvy GM. He has managed to keep Jarome Iginla in Calgary when it was thought he would leave. He brought in star goaltender Mikka Kiprusoff, acquired Alex Tanguay, and brought back Craig Conroy. However, bringing in a taskmaster like Keenan is the wrong thing to do. Sutter, like Keenan, is a no-nonsense, hard-nosed coach who demands excellence from his players whenever they take to the ice. Sutter, however, has the respect of his players whereas Mike Keenan has burned far too many bridges with his abrasive coaching style. When players stop listening, your coaching methods fall on deaf ears. This leads to more losses than wins, and Mike's record over the past 14 years is a reflection of how often he's been tuned out. If Mike Keenan is hired by the Calgary Flames, and there's nothing to say that he won't be, the Flames will limp into the playoffs if they're lucky. When you've only won 38% of the games you've coached in the last 14 years and haven't appeared in the playoffs in 12 years, your track record speaks for itself. Good luck, Calgary. You're going to need it. There have been many innovative things the New York Islanders have done over the years: the Captain Highliner jerseys, the Rick DiPietro lifetime contract, and the Alexei Yashin experiment to name a few. However, the New York Islanders Blog Box might be the biggest step forward for the NHL and NHL bloggers in recent memory. There have always been people who have an opinion. Weblogs, like this one, offer a chance for those opinions to be heard. However, a large number of blogs have been scoffed at by big business, including professional sports, as legitimate reporting of news and events. Alanah of Canucks and Beyond has been working towards getting herself included in the Vancouver Canucks' media scrums as an accredited reporter. Well, it now appears that the Islanders are seizing an opportunity to employ some of the most knowledgeable hockey fans. "Ever dreamed of reporting on the Islanders? Maybe you crave more Islanders-related articles and columns and want to do something about it? Well, if you're that type of die-hard Orange and Blue fan, consider this an opportunity of a lifetime. Introducing the NYI BLOG BOX, the first of its kind among pro teams in the New York area. The Islanders are challenging their fans with a passion for writing to start their own Islanders blog. Fans with existing Islanders blogs are welcome, too. But here's the kicker: all chosen bloggers will be given the opportunity to cover select home games and practices with special media accommodations. We're setting up a BLOG BOX in the Nassau Veterans Memorial Coliseum – sort of like a press box, but away from the scribes and broadcasters because we know you want to cheer, shout, have a pretzel and enjoy the game experience on your own terms. We will provide you with a media pass for a few games next season and a seat in the NYI BLOG BOX. You will also receive your own set of Game Notes when you enter the Coliseum Press Gate. All you have to do is bring your note pad and/or voice recorder and cheer as loudly as you want. After the game you attend, we will set up an area where you can toss a few questions at a coach or players, based on your requests and their availability. The NYI BLOG BOX will be your open forum. From start to finish, you'll be in control. All we ask is for the chosen bloggers to act respectfully in the restricted media areas and keep all critiques in good taste. Perhaps best of all, your Islanders blog will generate tons of hits because it will be highlighted and linked on newyorkislanders.com, one of the most popular websites in the National Hockey League. Only a handful of bloggers will be accepted for the opening season of this unprecedented concept. So if you're interested, please e-mail the answers to our simple application below to Corey.Witt@newyorkislanders.com and include a writing sample of no more than 500 words to go along with it. And please, passionate Islanders FANS only!" Now, I'm no New Yorker, and I haven't cheered for the Islanders ever. I do own a Fisherman jersey, and it is probably one of my most cherished jerseys. However, this is something I applaud. The Islanders are reaching out to their most passionate fans and giving them an opportunity of a lifetime. Kudos to Chris Botta, VP of Communications, Corey Witt, Media Relations Coordinator, and Jason Lockhart, Website Coordinator, for this innovative and excellent strategy. I will be keeping my eyes on this development because it could prove to be a very savvy move. Sometimes, people notice the smallest details. Whether it be a painting, a street sign, or a T-shirt, the smallest of details can be seen by someone with a trained eye. Imagine what that must be like for an equipment manager for a professional sports team. Popular players are worn on jerseys, and if that player makes the most minute change, people notice. And if something is missing from a jersey, people definitely notice. That's where New York Rangers' equipment manager Acacio Marques comes in. He's the guy responsible for all the on-ice equipment and jerseys that the players use. He recently gave an interview on the New York Rangers' website. "QUESTION: What is the process for assigning a uniform number, and how much input does the player have? MARQUES: The player has a lot of input depending on his seniority. A lot of it has to do with numbers that we have available. We had Pascal Dupuis, who came in and wanted No. 11, but that number is retired, so he obviously couldn't have No. 11. His next choice was 16, but Sean Avery had just gotten that number. So he chose 61, because it was basically the same numbers as 16, just reversed. Guys will kind of play with numbers. Same thing with Marty Straka. He was always 28, but on one team that he went to, 28 wasn't available. So he chose 82, and it kind of stuck. As far as younger players that come in from Hartford or at training camp, we tend to put them in higher numbers because we leave the lower numbers available for a veteran that might sign in September or whatever. There are certain numbers that are given to certain positions. Usually 2, 3, 4, 5 and 6 are defensemen's numbers, and 35 and 1 are goalie numbers. But since 1 and 35 are retired here, we've had to change it up a little bit. Obviously, Hank (Henrik Lundqvist) is in 30, but (Stephen) Valiquette's in 40 and Kevin Weekes has always worn 80. QUESTION: Do you contact a new player and ask him what number he wants before he joins the team, or do they just show up at the training center and you offer them a number at that time? MARQUES: It's a little bit of both. At training camp I pretty much just will contact the veteran players. Somebody who's just coming in on an invitation is going to get a number that I pick out. If it looks like he's going to make the team, we'll start picking his brain to see what number he wants to wear. But some guys will come in for camp, and they'll get a high number like 48, and they will feel that they've made it into the preseason and regular season, so they might want to stick with 48 because that's their new lucky number. QUESTION: When Brendan Shanahan joined the team a year ago, you gave him the No. 14, even though Jason Ward had worn in the previous year and was coming back for 2006-07? How do you handle situations like that? MARQUES: That was the easiest one. I talked to Brendan and told him his number was not a problem because Jason doesn't like 14. Brendan was willing to take another number, but I assured him that Jason had always wanted 16, but it had been taken by Tom Poti the year before. Poti had worn it as a kid, but had never worn it in the NHL before he wore it here. Now Poti's with the Islanders, where he can't wear 16 because it was Pat LaFontaine's number there and is retired. QUESTION: Do players get emotionally attached to certain numbers? MARQUES: I think they do. I remember (Sandis) Ozolinsh last year really wanted number eight, but (Marek Malik) had No. 8, so I told him it was already taken. We told him he could talk to him about switching numbers if he wanted, but Ozolinsh just wanted to know what else was available. So I told him 24 was available, and he said, well, two times four is eight, so I'll take 24. They'll kind of convince themselves of whatever they want. So for him, wearing 24 was the same thing as wearing No. 8. QUESTION: Is there any range of numbers that the Rangers prefer to assign, or is any two-digit number fair game for a player who requests it? MARQUES: We try not to give out high numbers because hockey numbers are somewhat traditional. But sometimes you get a guy like Michael Nylander that comes in, and all of a sudden he's 92, and then you have Marcel Hossa who's 81. You kind of tend to fall off that rule a little bit, but we tend not to give out the high numbers. QUESTION: How long does it take to put together an actual jersey for a player once he's acquired in a trade and you know what number he'll be wearing? MARQUES: I could probably have one in an hour. That happened with Dupuis. We were leaving for Washington, and before I left I made sure that we had the jersey in time. We carry blank jerseys, so if something does happen on the road and I can't overnight a jersey, I'll make up the jersey while we're on the road. We'll carry numbers, and the letters we'll trace out by hand and just stitch. We'll put it together ourselves. It doesn't look as nice, but you can't tell on TV. QUESTION: Is it true that the home team in the NHL is responsible for laundering the road team's jerseys? MARQUES: Yes, the home team takes care of the visiting team. We pick the jerseys up at the airport because we're the host team. They'll come in and we'll wash them and have them ready for game time. We'll wash their jerseys and our jerseys. QUESTION: When teams go on the road, how many jerseys does each player bring? MARQUES: It's pretty much just one jersey for every player. QUESTION: Has the game-worn jersey authentication process affected how you do your jobs? MARQUES: It has. It just means that we take the serial number off the jersey. We record it and who the player is and the time that he's worn it. QUESTION: How many jerseys will a player go through in a season? MARQUES: Four to six whites and four to six blues." Great interview into a rather unknown world. Personally, I think it would be one of the best jobs in the world, but it could also be quite demanding. Either way, it sounds like Mr. Marques loves his job, and you can't ask for anything more than that. Mark your calendars, people. We have another team unveiling their new Rbk Edge Uniform System on June 21st, and it is an Original Six team. The Boston Bruins have unofficially announced that they are going to be doing the unveiling a day before both the Washington Capitals and the Columbus Blue Jackets. While it hasn't been announced, or even mentioned, on the Boston Bruins website, ESPN.com and Uni Watch guru Paul Lukas made mention of it on his Uni Watch blog. Mr. Lukas notes on his blog that "[t]he Bruins will reveal their new uniforms on June 21st. The team was nice enough to invite me to the unveiling ceremony ('We know your views on hockey uniforms are well read and respected,' read the e-mail I received yesterday), but shlepping up to Boston on my own dime just so I can scarf some free hors d’oeuvres and take some photos that won’t be as good as the ones taken by the professional shutterbugs in attendance isn’t really my idea of a good time." I'm all for the Original Six teams keeping their current looks. They are timeless and classic looks. I understand that this change to the "uniform system" has been embraced by the NHL in order for them to make money off Reebok and the fans, and that's why I have been against this idea from the start. Some players have indicated that they like the new duds that Reebok is rolling out, and that's ok. Good for them. They get those jerseys for a flat rate of $0.00. Me? I'll be forced to pay through the nose to get one, and that is simply not something I am prepared to do in order to support "my team". In any case, June 21st is now the "Big Day". Mark your calendars, folks. It could be a day of happiness, or it could be a day of anger. My hope is for the first. Until next time, keep your sticks on the ice! The End Or The Start Of An Era? Just Call Him "Le Saviour"